All of the tools published by Innovative Resources have grown out of, or are compatible with, strengths-based practice. Also known as the ‘strengths approach’, this is a way of working that focusses primarily on strengths and hopeful possibilities. It does not ignore difficulties or challenges but the primary focus of this approach is focussing on the person’s hopeful pictures of the future, and the resources—both internal and external—that they can mobilise in support of their goals. 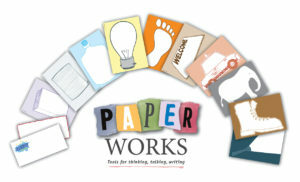 PaperWorks can be readily adapted for use within strengths-based frameworks that seek first and foremost to focus on ‘where to’ rather than ‘where from’, thus avoiding problem- or deficit-centred thinking and actions. 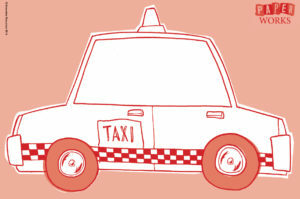 The taxi image is a perfect starting point for a strengths-based, solution-focused conversation about ‘where to’. This image gives many opportunities to broaden the conversation with questions about the fastest way of getting there, who else might be in the taxi, and what signs or landmarks the person can expect to see along the way. Others, such as the torch, light bulb, brick and welcome mat can also be used to stimulate conversations about preferred futures. Facilitators can ask what the person might notice if things were different or when progress is being made or goals achieved. A particularly rich vein of strengths, exceptions and resources can be unearthed by using the sparkling moments image. Facilitators can invite participants to write or talk about a moment of insight or delight; an incident—big or small—that caught their attention in a positive or inspiring way. This is such a simple, and yet such a rich way of inviting people to notice anything but the problem. Try it and feel how the atmosphere in the room changes almost instantly! To take the conversation even deeper into the territory of uncovering strengths, the sparkling moments tool can be combined with other images, for example, the water tank (by asking such questions as ‘What fills your tank?’) or the brick tool (by constructing a ‘wall of strengths’, for example). Once the person’s goals or hopeful pictures of the future have been given pride of place, several of the PaperWorks metaphors can be used to better understand what might be getting in the way. While images like the boot and the elephant naturally lend themselves to naming issues, they do so from a ‘person-centered’ perspective. For example, the boot might be used to name unhelpful things that the person wishes to walk away from. This conversation can be given a ‘strengths’ twist by asking about helpful things the person wishes to walk towards, or by asking what strengths they may want to draw on as they leave certain things behind. The tank can identify what no longer serves them (‘What drains my tank?’) or the elephant might be used to name hidden issues that it may be useful to bring to light.